In the July 10, 2014 post, I explained why I underwent a colposcopy and biopsy on July 9. It took two weeks minus one day to get the results, which I received by way of a phone call from an assistant in the doctor’s office at noon today. I don’t know why it takes so long to get simple lab results, but something is wrong with a healthcare system that supports one of the most anxiety-producing problems facing patients: waiting. Most of the phone calls I receive are solicitations, but every time the phone rang recently, I went into “yellow alert.” The young woman who called said that the biopsy was “benign,” which of course is very good news. But when I asked about the re-reviewed Pap, she said the report came back showing the same “atypical glandular cells of undetermined significance (AGUS),” which of course is still equivocal news, as discussed in the previous post. What bothered me was that she said the doctor wanted me to return in three months for a repeat colposcopy. This might not sound too bad, and the three-month period actually sounded encouraging. But a repeat colposcopy? This wasn’t encouraging at all. Not only is this a painful exam, but it contradicts what the doctor told me when I was in the office two weeks ago—that I should return in a month for a repeat Pap. And, of course, the previous colposcopy did not elucidate the Pap results. So I asked her to ask him why he had changed his mind. About three hours later, I received a call from another woman in the doctor’s office re-giving me the same results. I explained that I had already received a call and had left a message for the doctor about the altered instructions. She looked in the computer and found notes, including a response from the doctor to the first woman that it was fine for me to return a month from my previous visit (two weeks from now) for the repeat Pap. That was a relief, even though the appointment is sooner rather than later. But this episode reinforced to me that patients really do need to ask questions and be on top of their own care plans until they get answers that make sense to them. Vaginal Biopsy: Squamous Mucosa. No Pathologic Changes. In other words, this was benign vaginal tissue, normal squamous (“scaly”) cells, as the doctor thought when he took the specimen on July 9. Cytopathology Consultation Report: General Diagnostic Category—Atypical Glandular Cells of Undetermined Significance. In other words, an equivocal and somewhat worrisome result that remains unchanged since the previous report of the specimen taken on June 19. This seems to go along with my problem of light vaginal discharge, although we don’t yet understand why. I was surprised to see that this second Pap report (of the same specimen) was read by the Department of Pathology at Saint Barnabas Medical Center, whereas the first report came from a private lab. In retrospect, this makes sense—getting a second opinion on the same slide. Only time will tell what all this means. My next appointment is on August 12, so it will be two weeks after that—or about a month or so from now—before I get a new Pap reading. In the meantime, I have several more topics to explore—including more thoughts on the art of waiting (see the January 12, 2014 post)—so please check back soon. Highlighted/underscored text, images, and media contain links to external resources for further education, empowerment, and encouragement. HysterSisters – Colposcopy after a hysterectomy? 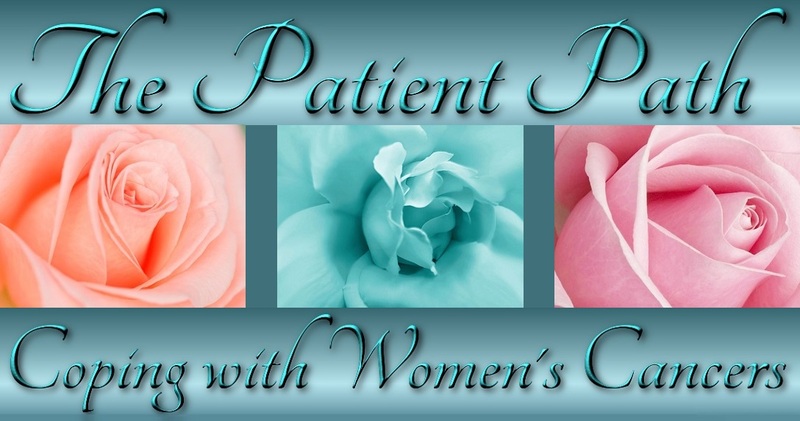 For more information about my personal story with uterine cancer and also about diagnosing and treating this disease with surgery and radiation, please see the Uterine (Endometrial) Cancer page for links. And stay tuned for more information about this very important topic. Finally!!!! I am so relieved for you (and for myself also). At least you can sleep in peace tonight (I hope). You have been through so much and I am so grateful that this was benign. My hope is that you can get on with your life now and move forward with peace. Congratulations, honey. I love you very, very much. Mom. Overall, I’m relieved, too. Just need to find out what these “atypical” cells and discharge are all about. But I feel all right, so . . . onward. Hugs back. . . .